Release Date: ‘29th’ June 2018. Just over six years ago, North Carolina-based Senegalese kora master Diali Cissokho and Kaira Ba released their debut album Resonance in April 2012. Resonance featured songs about mythology, migration and justice, while Diali Cissokho and Kaira Ba combined elements of African and Western music. Almost seamlessly, Diali Cissokho and Kaira Ba fused music that could be traced back to the ancient West African griot tradition with Western rock music. This was a new and exciting combination that Diali Cissokho and Kaira Ba revisited on their sophomore album. This was The Great Peace, which was released to praise and plaudits in March 2014. Just like Resonance, The Great Peace featured songs about mythology, migration and justice. However, it wasn’t just the critics who were won over by the music on The Great Peace, it was the judges for the prestigious Africa Music Awards. Diali Cissokho and Kaira Ba’s sophomore album The Great Peace was nominated for what was the African continent’s premier music award later in 2014. Considering The Great Peace was only Diali Cissokho and Kaira Ba’s second album, this was seen as a huge achievement. Just four months after The Great Peace was released, theMTV Africa Music Awards took place in Durban, South Africa, on the ‘7th’ of June 2014, but that night, it was a case of so near yet so far for Diali Cissokho and Kaira Ba. However, the had come a long way in a relatively short time. Six months later, in January 2015, Diali Cissokho and Kaira Ba released a new single The Great Peace Remixed. It featured Direwolf’s remix of Bamba Wotena and Apple Juice Kid’s remix of Mbolo on the B-Side. Little did anyone know it would be nearly three-and-half years before Diali Cissokho and Kaira Ba returned with some new music. 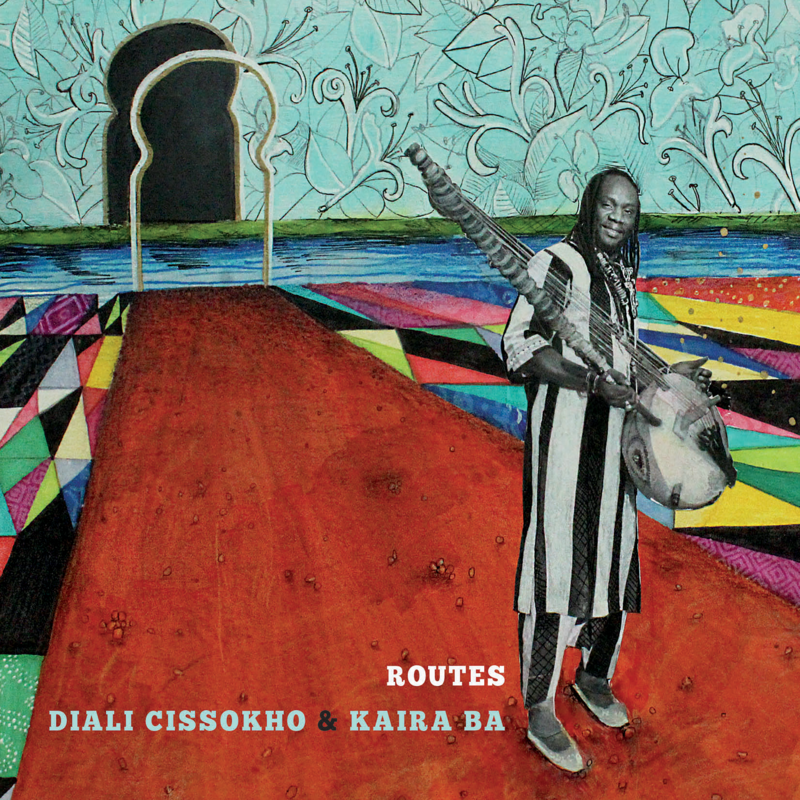 Soon, the wait will be over and Diali Cissokho and Kaira Ba will release their much-anticipated third album Routes, which will be released on Twelve Eight Records, on the ‘29th’ June 2018. It’s the latest chapter in a story that began far from North Carolina. Although Diali Cissokho was born in M’bour, Senegal into a family of griots, he comes from a long line of Mande musicians and can trace his heritage back to the 16th Century Malian Empire. The Mande musicians were originally trained to encourage exchange and conversation, sooth troubled hearts and rouse the spirits of others. This was regarded as an important role, which the Cissokho family had carried out for 400 years through the medium of music. Growing up, Diali Cissokho like all griots, was taught to play the kora, sing, and write songs that praised patrons, recalled past events and heal intense conflicts and emotions. This was an important role, and one that was taken seriously by griots like Diali Cissokho. Despite that, Diali Cissokho left his home in Senegal and travelled across the world to North Carolina. The reason for Diali Cissokho’s journey to North Carolina was that he had fallen in love, and would eventually marry an American student of Senegalese music. Initially, Diali Cissokho felt lost in North Carolina, which was very different to where he had grown up in Senegal. However, it was music that helped Diali Cissokho make friends in his new hometown. As the band’s music started to take shape, friendships were forged between the band. Their music was driven along by the explosive rhythm section, and by then, bassist Jonathan Henderson had mastered the rhythms and melodic arcs that were at the heart of Diali Cissokho’s music. This was combined with traditional percussion, trapset drums and snakelike guitar licks as Diali Cissokho delivering impassioned vocals on songs about mythology, migration, justice, and universal love. Many of these themes were centuries old, but were still relevant as Diali Cissokho and Kaira Ba continued to create carefully crafted, multilayered songs which featured funky licks and memorable hooks. Partly, this came about through Diali Cissokho and Kaira Ba jamming, and honing and tightening their sound. This paid off and in April 2012, Diali Cissokho and Kaira Ba released their debut album Resonance. Just under two years later, they returned with The Great Peace in March 2014. It was nominated for one of the prestigious Africa Music Awards. Diali Cissokho and Kaira Ba had come a long way in a short space of time. However, the followup to The Great Peace, was eroded by Diali Cissokho and Kaira Ba in Senegal and North Carolina. For some time, Diali Cissokho had wanted to take the members of Kaira Ba back to his hometown of M’bour to record an album. which later became Routes. However, there were a few teething problems before recording got underway. After getting off the plane, and heading into the port city of M’bour, Diali Cissokho and bassist Jonathan Henderson spend hours looking for somewhere to record Routes. The concrete block buildings they were shown were not suited to recording an album, and by then Jonathan Henderson remembers: “We were wondering if we’d ever find the right space. Then Diali ran into an old friend at the mosque. He owned a hotel and showed us this really beautiful eight-sided, rattan-panelled room on the third story. You could see the ocean. For a week, we set the studio up there, using our engineer Jason Richmond’s mobile rig. And in the courtyard outfront, we recorded the big percussion parts.” During the next week, some of Diali Cissokho friends and family arrived at the makeshift studio and some played a walk-on parts and occasionally added inspirational performances on Routes. However, there was only so much that could be recorded in M’bour, and after a week the musicians headed home. The remainder of Routes was recorded in North Carolina, with the help of some talented local musicians. This included violinist Jennifer Curtis, mandolin player Tony Williamson, jazz and gospel vocalists Shana Tucker and Tamisha Waden, pedal steel player Eric Heywood, and some local jazz instrumentalists. Meanwhile, gospel vocals were added to Salsa Xalel and lush strings to sweetened the sound of Naamuusoo. Just like Salsa Xalel, Naamuusoo tells the story of the two places that Diali Cissokho has called home. With these tracks complete, Routes was nearing completion and Diali Cissokho and Kaira Ba would soon return with their third album. Routes proved to be a very different album, and one that had a much more eclectic sound than Resonance and The Great Peace. Diali Cissokho and Kaira Ba were responsible for an album that featured everything from uplifting, dancefloor friendly traces right through to a much more intimate and ruminative sounding songs that encouraged the listener to reflect. Especially as they when they listened to Diali Cissokho’s delivery of the lyrics while Kaira Ba provided a musical backdrop as two cultures combine. Opening Routes was Alla L’a Ke which is akin to a conversation between Diali Cissokho and Kaira Ba.They provide an atmospheric backdrop before Diali Cissokho’s kora solo is joined by rattling percussion and his heartfelt vocal. Sometimes, he sings call and response before a string quartet augment the band, during this beautiful fusion of Afropop and rock. Badima finds Diali Cissokho paying tribute to his family, as he remembers a day when discord was resolved and harmony restored. Although it’s a song with message, it’s melodic and also showcases Diali Cissokho and Kaira Ba’s talents. In Senegal, like much of West Africa, salsa has been popular for many years. However, Salsa Xalel is salsa with an American twist. Diali Cissokho and Kaira Ba add a balafon and talking drum to this multilayered mix which is an irresistible example of salsa played by American and Senegalese musicians. The tempo drops on the poignant ballad Saya, which features a soul-baring vocal from Diali Cissokho, who wrote the song after mother passed away: “Right when we buried her, everyone started to walk back home. I couldn’t. I stayed in the cemetery. I started to turn home and this song came to my heart. I went to my uncle’s room. He used to play kora until he grew older. I asked him if I could borrow it, because I needed to play this song. My uncle and everyone told me no, we had just buried her, but then they listened to what I played and started crying.” No wonder as it’s a beautiful, poignant song that comes complete with weeping pedal steel. Ma Cherie features another heartfelt, emotive vocal from Diali Cissokho, who sings call and response against an arrangement where two cultures combine. It’s a similar case on Baayi Leen, which initially, has an understated arrangement, which allows Diali Cissokho’s vocal to take centre-stage. Gradually, the arrangement reveals its secrets and it’s soon apparent that hooks haven’t been spared during this melodic and memorable song. The kora opens Ndoli before Diali Cissokho unleashes an expressive and emotive vocal. That is the case on the genre-melting The Story Song, where Diali Cissokho delivers a vampish, but soulful vocal as he sings of equality against an arrangement that marries elements of African music, funk, rock and Southern Soul.The understated arrangement to Xarit meanders along, as Diali Cissokho delivers a tender, emotive vocal. Very different is the uplifting and joyous celebratory sounding dance track Naamusoo. It’s a call to dance, and resistance is impossible, best just submit to the song’s charms. Closing Routes is the atmospheric Night in M’Bour, which transports the listener to Diali Cissokho’s birthplace and offers an authentic reminder of life in Senegal. This comes courtesy of sabar drumming, while children chant during prayer time. Later, the sound of the distant sound everyday life is replaced by a soulful vocal from Diali Cissokho’s nephew Mamadou that accompanied by a guitar, before Routes draws to a close. Just over four years after Diali Cissokho and Kaira Ba released their sophomore album The Peace Route, they make a welcome return with their third album Routes, which will be released on Twelve Eight Records, on the ‘29th’ June 2018. Diali Cissokho and Kaira Ba’s third album Routes, is a carefully crafted, genre-melting album that features eleven new songs that range from ruminative ballads to uplifting and joyous dance tracks. These tracks find Diali Cissokho and Kaira Ba fusing music that could be traced back to the ancient West African griot tradition, with Western rock music. There’s also elements of Afropop, funk, jazz, rock, soul and Southern Soul on Routes, which is Diali Cissokho and Kaira Ba’s most eclectic album. Routes showcase the considerable talents of singer, storyteller and Senegalese kora master Diali Cissokho and his American backing band Kaira Ba. They reach new heights on Routes, where Diali Cissokho and Kaira Ba fulfil the potential that was apparent on their first two albums. It’s a case of third time lucky for Diali Cissokho and Kaira Ba on their career-defining album Routes, which they began recording in M’Bour, Senegal, and finished in North Carolina, which is now home to kora master Diali Cissokho. ← RAMSEY LEWIS-FUNKY SERENITY, RAMSEY LEWIS’ GOLDEN HITS, SOLAR WIND AND SUN GODDESS.